Yeah. We’re gonna need a bigger graph. 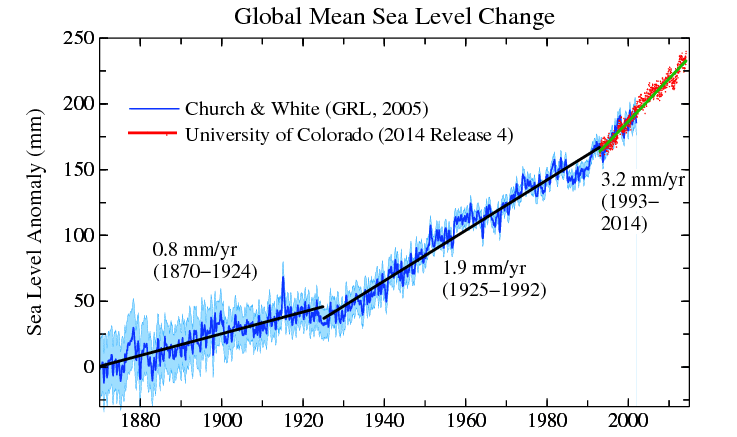 That rise in sea level graph looks like the rate doubled in 2010-11: 6 to 7 mm per annum now. We’ll probably know next year if we’re seeing ice sheet melt doubling every five years. And a doubling in five years means we get the ten-foot sea level rise earlier. If we’re very lucky, this rise might be followed by a drop as happened a few years back, but with El Nino still ramping up, and increasing instability in the cryosphere, “I hae ma doots,” as my Scottish father used to say. This is an extremely worrying event, which is not unexpected. It definitely requires close monitoring. Here in Colorado, loss of beach front property is not a problem, but insurance rates may soon (Willie Soon?) be rising in Florida. Don’t forget to add in the melt water from all the mountain Glaciers which are melting fast, and Alaska, Canada, Siberia. SYD, There will be no need for ins rates to rise. Ins companies will just do what they have always done: not pay their claims or low ball poor people & government will do nothing about it. Then they will crawl back under the rocks they came out of. Dr. Box does a great job with this one. Shows how much the cutting edge science has progressed. There’s still a lot to learn, though.